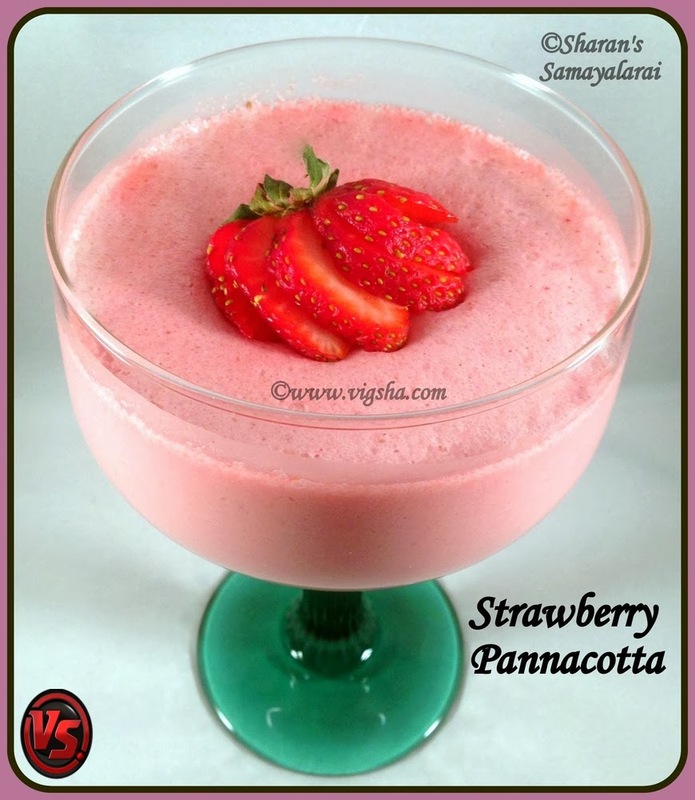 Panna Cotta is an Italian dessert of sweetened milk cream and set in gelatin. It is a simple yet elegant and refreshing dessert. Also it is perfect for a party, undeniably it will become the showstopper. I love wobbly desserts and this was my first attempt at making panna cotta at home. I've been wanting to make panna cotta for a long time but every time other recipes took it's place. Thanks to Preethi(Sweet Fantasy Club), for choosing this dessert and this is our second challenge for this month. I have flavored it with vanilla and strawberry sauce and finally topped it with fresh strawberries. The dazzling strawberries provides a striking contrast with the pink panna cotta beautifully. 1). In a medium saucepan, bring the cream, milk and sugar to a simmer over medium heat(do not boil). When Sugar dissolves remove from heat and add vanilla extract. 2). Sprinkle the powdered gelatin over 2tbsp of water and let sit for 5-10 minutes to soften. Stir gelatin into the milk and whisk for a couple of minutes or until the gelatin completely melts. Divide this cream mixture equally into two bowls. Keep it aside. 3). Reserve 2-3 of the best looking strawberries for garnishing and roughly chop the remaining strawberries. In a pan, put the chopped strawberries, sugar and water.Bring to a simmer and remove from heat immediately. Let it cool and blend it to a smooth sauce. Pass through a strainer to remove seeds out of the sauce. Mix in the gelatin and set aside. Pour mixture through a fine mesh sieve into a bowl. 4). Mix the prepared strawberry sauce with the cream mixture. Pour it in the serving glasses leaving 3/4 th of the space and refrigerate until it sets, for about 4 hrs or overnight. Timings depending on size of glass, but be sure not to take it out too early. Once done, top panacotta with fresh strawberries and a sprig of mint or Unmould onto serving plates, spoon the cooled sauce over the top and enjoy! To invert the panna cotta, Tip the bottom of the ramekin(mould) in a bowl of hot water for 10 seconds. Run a thin knife around the edges of the ramekin(mould). # The cream/milk mixture should only be heated long enough to dissolve the sugar and and at no time should the mixture come to a boil. # The options for flavoring a panna cotta are endless. You can make variations with the fruit sauce, from strawberries to other berries, cherries, peaches or apricots. # Once Panacota is firm and set, place a sheet of plastic wrap directly on the surface of the panna cotta to prevent a thick skin from forming. # Do not add gelatin powder to things with fresh pineapple, kiwi or papaya, as they will inactivate the thickening properties. Also, don’t boil gelatin, as it will lose its thickening ability. #You can make it a day before serving or even few days in advance.